UKTV channels are returning to Virgin TV | What Hi-Fi? Last month, Virgin Media TV subscribers lost access to UKTV channels (which include Dave, Gold, Alibi and Yesterday), blaming on-demand rights restrictions put on UKTV by the BBC. The 23 lost channel slots were replaced with HD content from the Paramount Network, YourTV and Love Nature. 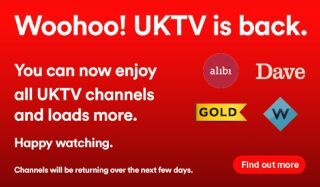 However, the two companies have now reached a long-term agreement that means UKTV channels will be restored both to Virgin TV and Virgin TV Go. Not only that, the replacement channels will remain on Virgin TV - and UKTV will provide Virgin customers with more HD and on-demand programming than ever before. For the first time, the Dave HD and Gold HD channels will be added to Virgin Media’s Mix bundle as well as the subscription tiers above it. And five times the amount of on-demand content will be available, including ‘significantly more’ boxsets for Virgin TV Full House subscribers.